In honor of Cinco de Mayo, Conservative Book Club sat down with Michael P. Foley, author of Drinking with the Saints: The Sinner’s Guide to a Holy Happy Hour! This fun and irreverent guide brings together the saints, cocktail communion, and an endless supply of happy hour theme ideas. Read the fun interview below! Congratulations on your new book, Drinking with the Saints: The Sinner’s Guide to a Holy Happy Hour! What a fun topic for a book! Where did you get the interesting idea to write about the saints and happy hours? Thanks so much! My family and I have always enjoyed observing traditional customs of the Church year, such as preparing special foods for special feast days. My wife and I have also come to enjoy an evening cocktail together, especially after a hard day of homeschooling our six children. After a while, the love of the sacred calendar and the love of the drink dovetailed, and I began to wonder if there were specific beverage traditions assigned to specific holy days. In some cases there were, but in most cases there weren’t. Hence the need for this book, which pairs beer, wine, and cocktail suggestions for over 300 feasts of the liturgical year. I also include suggestions for making an appropriate toast or practical advice on how to throw a party for the occasion. Why did you write this book, and what do you hope people will take away after reading it? Why write the book? Because it needed to be written. There are dozens and dozens of Christian cookbooks in publication, but there has never been a single Christian bartender’s guide, a work exclusively devoted to “liturgical mixology.” This was a lacuna sorely in need of remedying. Think of all those dry, pious throats! I hope people will walk away with a deeper appreciation of the Saints, those remarkable friends of God, and with a greater capacity for true merriment, by which I mean a combination of fellowship, joy, and gratitude to our Maker. “Liturgical Mixology” is my new favorite term! In the book, you document numerous feast days and their celebrated histories. Which feast day do you think is the most salacious? Some of my drink suggestions can be a little cheeky in the way that good friends often tease each other, as I consider the Saints my friends even though I am hardly on their level. St. Agatha, for example, was a wonderful early martyr who is portrayed in Christian art holding a tray with her severed breasts on them. 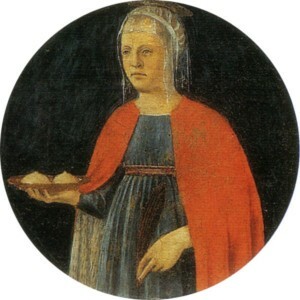 She even became the patron saint of bakers because some folks thought her tray was holding loaves of bread. 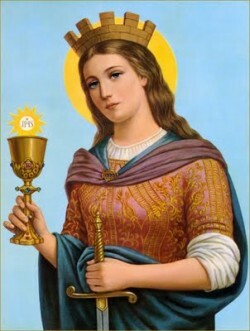 So for her feast day I recommend a vintage cocktail called Twin Peaks. That’s amusing! Is it true there is a patron saint of hangovers? What is your preferred cocktail of choice? Lady Continence. The Lady Continence, which contains fig vodka, a honey simple syrup, and fresh lemon juice, is particularly good. What books, or conservative-themed books, influenced your political philosophy and outlook on life? The Conservative Book Club is now celebrating its 50th Anniversary and has recently relaunched for the digital age. How can the Conservative Book Club be helpful to authors like you, and the broader conservative reader community? Congratulations and keep up the good work! It is especially important that people today have access to thoughtful conservative reflection. The American conservative movement got its legs thanks to educated and intelligent men like William F. Buckley and Russell Kirk making careful, reasoned arguments for their views. Conservatism is doomed if does not have a dispassionate, intellectual dimension seeking higher wisdom. How’s that for advice from a guy who just wrote a book about booze? Very good indeed! Congratulations on your book and we wish you the best of luck!